Today I learned about a 56 year old man who was killed riding his motorcycle. He was killed by a 22 year old boy who tried to make a left turn. Unfortunately, that left turn was made right into this motorcyclist as he was just driving along. This wasn’t just a horrible accident, but this young boy had a prior history of driving impaired. He should never have been behind the wheel yesterday, and has a previous E Felony conviction for DWI. When he hit this motorcyclist, it was reported that he tried to flee the scene. Once again he was found to be driving under the influence and has blood tests pending to determine what he had taken prior to getting behind the wheel. In an aside, I have 3 children ranging in age from 24, 21 and 20, it breaks my heart to know that, at such a young age, he loses too. I have been thinking about this all day today since I learned of the tragedy. I ride a motorcycle, too, but there is more to this situation. It didn’t have to be a motorcyclist, but it could have been a mom taking her baby for a walk, or a boy with his dog, or a kid riding a bike or on a skate board. So, here’s my usual disclaimer — I don’t intend to be preachy as I write the rest of my “weekly reflection”, but just kind of am working this situation through my mind. 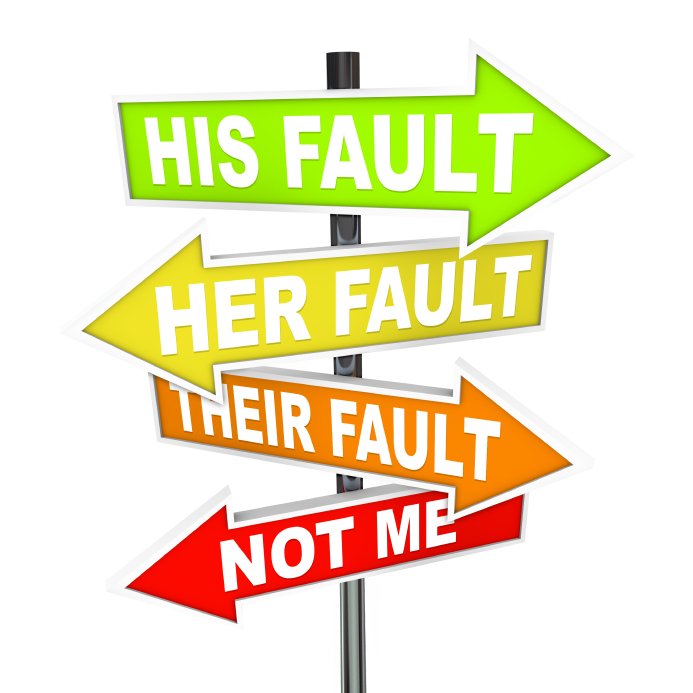 We can blame a ton of things for our own personal lack of accountability. This lack of accountability can be applied to every aspect of our lives. It can be applied whether we cheat on a loved one, or cheat on a project we are assigned, or cheat on a situation at work, or if we somehow take advantage of someone, or if we don’t do as we promised. In many situations, a lack of accountability for one’s actions, and the decision we make, can tragically and irreversibly impact the life and lives of others. Unfortunately, I believe that we have become desensitized to the results of no accountability. In the case of driving while impaired, or while under the influence, this happens again and again. No matter how much education is provided. No matter the efforts and advocacy by MADD and SADD. The holiday season is upon us. This gentleman’s family will be affected every Thanksgiving, remembering this tragic day of loss. At 56 years old (I’m turning 50 next week), I am sure that he had so much more to do in his life. In a situation where we may be driving, we all have an opportunity to embrace accountability, to designate a driver, and / or to make arrangements to stay overnight at a location or arrange for transportation home via a taxi. WE each have the responsibility and accountability to not get behind that wheel when we are not capable to drive and risk hurting others. In every situation, we all have the responsibility to be accountable for our actions, to not blame someone else for our actions. This pertains to our health, our family, our place of business, and even our happiness. If we each embraced personal responsibility, things would move along so much more smoothly. Just think what would happen if we really considered our actions before we acted. Doreen Guma, MA, FACHE, CPC, CLC is a board certified healthcare executive, a certified professional life coach, the founder of the Time to Play Foundation, a 501c3 not for profit corporation inspiring everyone to enjoy life and author of If I Knew Then What I Know Now, Our Quest for Quality of Life. The concept behind time to Play and the Time to Play Foundation was absolutely created out of LOVE. Please see www.timetoplay.com for more information. Something hit me while I was in the kitchen this morning. I saw the sun coming up through the trees. I’ve seen this similar occurrence over these past 24 years living in our home. But, this time it was different. A little voice inside my head said, “The sun will continue to rise and set”. The sun will rise and set with us or without us. It does not matter. Without causing anyone to feel disturbed or upset with me for my continued thought process surrounding this reality check, I’m going to share it here. It’s your choice to read it or not, and to agree or disagree. We are each just a small piece of the puzzle. But, it hit me today how so many people, individually, thinks they are what the world revolves around. How they think their problems are more important than other people’s problems, or the most important thing to the extent that nothing and no one else matters. We also have seen such actions in Paris with this latest, unconscionable slaughter. We know this is not the first such horrible circumstance, but something that has happened since the beginning of time. Some person, somewhere, believes their way of life is the right way and tries to impose it on others. We’ve seen this again and again throughout time with one people conquering, segregating, or persecuting another because they are not the same. And, as we have seen, it gets sadly extreme. Look at the holocaust. Look at religious persecution. Look at any and all types of discrimination. I wrote in my book, If I Knew Then What I Know Now that history will continue to repeat itself if we let it. Every day I can find situations – whether large or small – that we make this statement true. At some point we have to realize we are all connected and that whatever our actions are cause a ripple effect. We’ve seen this from the smallest gesture of just giving a person a smile – it can change their whole outlook, the course of their day and, perhaps, even save their life. We are here on this earth for a very short time. It is truly up to us, individually and collectively, to make the experience a pleasurable one for everyone, or one of despair. I believe there is a solution for every problem if we can just take a moment to step back and really look at a situation and the options available to us to make a change. Imagine what would happen if people chose love and happiness. After all, I believe it is time to enjoy life. It is Time to Play. This has been a topic of discussion that some of us at the Time to Play Foundation have been thinking and talking a lot about this over the past week. This proverb has been around and passed down from generation to generation. I talk about the wisdom of those who came before us in our book, If I Knew Then What I Know Now. These idioms and proverbs interest me greatly. 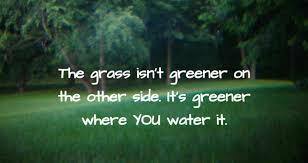 The Grass is Always Greener on the Other Side … Think about this for a moment. Do you or someone you know always think they would be so much happier in a different life situation? I believe this philosophy is actually dangerous to a certain extent. Why? Because each time you run toward something while running away from something, it may surely lead to becoming disappointment. I actually tried to do this in the year 2004 when I decided that moving our family to Florida would be a solution, would give me peace (after all, life is hard, you know?) and a new way to start over. I was looking for “easier”. Thankfully my husband is the voice of reason. Moving, he said, would not solve anything, and that once the “honeymoon period” was over I would find life the same as before we would have moved. We didn’t go, which did force me to reevaluate my life situation, evaluate potential options, and make changes that were more reasonable. I believe we could apply this “running away from” theme to anything and everything in our life experience, relationship or job. But, guess what? The circumstance surrounding the concept of “it will be better when” does not necessarily provide a solution, and, sometimes potentially, can create more problems. In many cases, the issue you are running from will follow you, because, perhaps, they start inside you. The most important thing we can do is find peace and happiness in ourselves. This is something we’ve been researching and working on, too (see PREinvent YOUR Life® article and survey for more info). At this point in my life, I do not believe that there is anything tangible in this world that can fill a void inside of us: not another person, not a new car, not a new home. If there is unrest and despair in our hearts, we have to evaluate why and what we can do to start to heal. I found an article that included this quote that I thought most appropriate here: Buddha once said that the way to happiness is actually quite simple; the secret is to learn to want what you have and not want what you don’t have. Again, I believe the secret to peace and happiness is in ourselves. Nurturing ourselves is where we may have to start. Take a moment today to stop and look deep inside. We sometimes just have to take the time to listen, evaluate our best options, stop reliving the past that keeps us “a prisoner” (chapter two of my book, “We are all tortured souls”), and move forward towards what we need to do so we can enjoy life. After all, I believe everyone deserves the opportunity to enjoy life. Ask yourself: When you talk to other people… people you may work with, people in your family — your spouse, your siblings, your kids… do you encourage or discourage? Do you propel a person to greatness or do you say something that can break their souls? I’ve been thinking about this ever since Stacy Gertz, an amazing and important part of our Time to Play Foundation’s team, shared a video about a woman, Lisa Nichols, who was discouraged at 19 years old by teachers who told her she was a terrible writer and a terrible speaker https://youtu.be/Kcu92UlIQfs. If you take a few minutes to listen to Ms. Nichols’ video you will also learn how she was in a situation where she was economically disadvantaged. She said she found herself in a life situation where she said she was broken in every way. How did this happen? Could the words she heard while she was younger have impacted her in a negative way? I believe they could have been a contributor to many years of her negative life experience. She had a lot going against her. She could have given up, but she found power within herself, against all obstacles, to change her life. This is an observation I have made over these past years working on the Time to Play Foundation, a not for profit organization intended to inspire others and provide resources for a better life. I believe that, sometimes, we live in too many years in the “what is expected of us” or the “I can’t”. After almost 50 years of my life, I have started to understand the power of “can’t” and the power of “not possible” that we seem so inclined to adopt; perhaps starting because of the opinions from others. I’ve included here another really short and pertinent video (it’s only 1 minute and 16 seconds) that gives incredible examples of “can’t” that people overcame – people including Walt Disney, Lucille Ball, and more: https://youtu.be/hzBCI13rJmA. This story of “Can’t” is retold by so many again and again. The good news is, I have learned it is ever too late for “CAN”. Henry Ford was 45 years old before beginning to be successful. Just look at the empire he built and his legacy. I believe it is never too late for any of us. I believe the “trick” is to encourage our younger generation via OUR impact vs. the need to unbury the “CAN” later in life after so many years of believing the “CAN’T”… to gain and to give the tips and tools from those who are older and have had the experiences that could save others some time. To encourage others to PREinvent their life®, not reinvent, as so many do again and again. In closing, again I ask…. 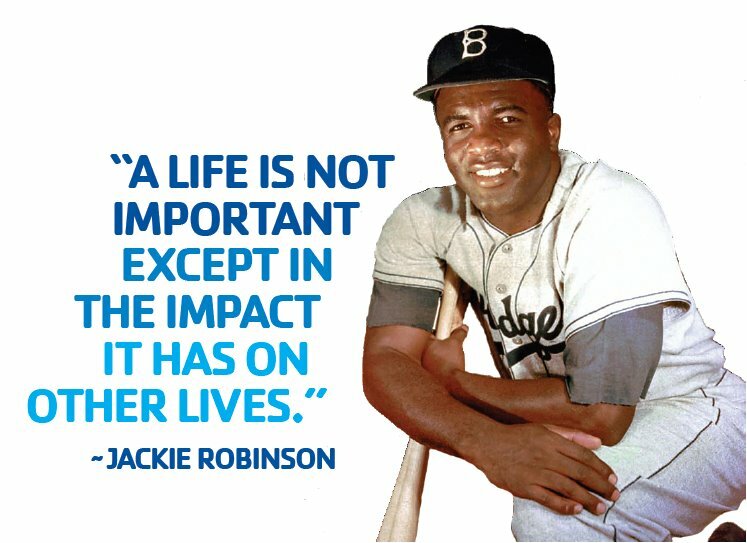 What is YOUR impact on others? Do you encourage and propel? If the answer is no, I hope you will take the time to stop a moment and identify why not. If the answer is yes, perhaps you can give me a call (631-331-2675 or email me doreen@timetoplay.com) so WE can move forward, together. #PeopleHelpingPeople. Just imagine the IMPACT, then. After all, I believe it is time to enjoy life. https://i0.wp.com/www.timetoplay.com/wp-content/uploads/2015/11/impact.jpg?fit=747%2C543 543 747 Doreen Guma http://www.timetoplay.com/wp-content/uploads/2019/02/TIME-TO-PLAY-LOGO-resources.png Doreen Guma2015-11-01 13:35:192015-11-01 13:35:19What is YOUR Impact on Others? In my book, If I Knew then What I Know Now, I wrote how there is so much wisdom in the past experiences of others and how people who have come before us left information behind for us to use in our lives. I have also come to the realization that we don’t necessarily use this wisdom but reinvent… and reinvent… and reinvent “new” ideas. Please don’t get me wrong. I’m not trying to say we shouldn’t invent things that are new ideas. People are forever thinking and dreaming, which is absolutely part of life and what moves society forward (perhaps that’s subjective depending on the subject – maybe we move backwards, sometimes, too). However, introducing an idea of reflecting on what was learned in the past, and how the information could help us, was the best way I could think of to introduce the topic of this article and the following discussion. I’ve been “dabbling” in learning about Chakras here and there over some years / months, but never really delved in. Some people will say, “Oh, that’s hokey stuff”. My husband is one of them. BUT, I truly believe there is real validity in this knowledge. Last night I sat at the kitchen table speaking with my daughter Jackie and her friend. They are working very hard on reconnecting to “source”. They are only in their early 20’s; and, with what I know now after many years of reading and learning, am so grateful that they are where they are at this point in their lives. I only wish I had been more aware so I could have shared what they are learning now with them when they were younger. At this point in their awareness, they have far surpassed my awareness, to which I am grateful. So, after that long introduction and explanation, here’s what happened that has caused me, a person who will turn 50 in a few days, to consider this “new” concept that has been around well over 3,000 years. I believe what I learned this past week was valuable. For those who think it is “hokey”, that’s o.k. But, hopefully, my sharing my story and experience will help someone else. Anyone who knows me knows I am a little stubborn. I get an idea in my head and, no matter what, I will strive to accomplish it. But, here’s the bad part. I don’t listen. I don’t listen when people say it’s not the right path. This past week, my not listening fully affected my body, as well. Looking back over the years in my life, I realize that “not listening” to signs and experiences have adversely affected my health and my body many times. Remember the Time to Play Philosophy is “happy, healthy, have money and work life balance”. When we do not feel well, being happy and feeling healthy certainly are disqualified from this equation. Perhaps, based on the circumstances, we lose the “have money and work life balance”, the other two parts of the time to play philosophy, too. BUT, if we are listening, we can circumvent a negative life experience. So, this past week I actually created a physical illness in what I’ve learned was my root Chakra while fighting for something that I was told was not the right move. I, myself, believed it was and was going to do everything I could to move forward. And then, this past Thursday night, not only did I not sleep, but became physically ill including an upset digestive system, fatigue and joint pain throughout my whole body. It was at that point I “woke up”. 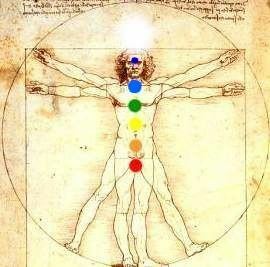 Armed with the little knowledge I had about Chakras, I realized there was a root cause to what I was feeling. So I went to the all-knowing Google and searched for the symptoms of a blocked / clogged Root Chakra. What I read was what I was physically experiencing. I have been following Lisa Beachy and her morning wisdom for some months. I knew she had a meditation for clearing the Root Chakra (https://www.youtube.com/watch?v=ol5rRFSC1_s – it is only 4 minutes long), which I took the time to complete. I included it here if you think that you may need it, as well. Before this “aha” moment, I hadn’t really understood. This whole experience was something I actually needed. Almost 50 years of life did not give me the education that I did receive in this one stroke of awareness. Once I listened, and “got it”, my body, physically and emotionally, started to become well. I don’t intend to give anyone information that they may feel uncomfortable with, but kind of think this information has merit and is worth looking into and considering. We all know we can make ourselves physically ill and have heard of people having a heart attack due to stress. This chakra stuff has been around forever, originating in India between 1500 and 500 BC. In my book I wrote how we make mountains out of molehills, and maybe investigating the Chakra system may be one path to search for what ails us and affects our quality of life. BUT, please note – this is not an easy fix. From what little I understand, the Chakra system starts with our mind and our thinking, two areas that may be the hardest to affect. Something else I finally “got”: How our emotions are our guide if we are doing something we should or if we are not. I have been learning this, telling people this and reading about this, but, again, didn’t “get it”. Hopefully now that I understand a little better what this whole emotional guiding system is, I can use it to better enjoy my life. The concept makes sense, but reading and saying is much different than doing because you “get it”. I learned I need to “Just Listen”. Additionally, please go to www.spritualgirlfitness.com and download Lisa Beachy’s “How to Eat for Your Chakras”. I believe that the easy to understand information I listened to yesterday, and wisdom she imparts on her audio program, (it’s 38 minutes long) was very valuable to me. If you are feeling crappy in any way – headaches, exhaustion, joint pain, etc., it may really be worth a few minutes of time to listen and look into. I believe the whole thing makes sense and is useful to have in our “toolbox” of skills for life. I know that every day is a learning experience. I know it gets tiring to hear me say that, but, it’s true. No matter how you think you’ve “gotten it”, learning is continuous. I, personally, do not believe that any one of us is an “expert” in life, nor do I believe that any one of us is perfect. We can just try the best we can. Hoping my “aha” gives you an “aha”! At this point in my life I truly realize that every day is a learning opportunity. Sometimes I wish the lessons didn’t take so long to get here. Yesterday I went to the wake of a dear friend’s mom. We hadn’t physically seen each other in over 20 years. I think the last time was at our 10 year high school reunion. We had been the best of friends all through high school, and, if I remember correctly, junior high, too. We had participated in countless sleepovers and events – and then she moved away to go to college and we lost touch. Our only connection for these past years has been the holiday cards sent to each other. Seeing her yesterday at the wake for those few moments made me truly wonder. Of course, firstly, I wonder where in the world had the time gone??? How could it have been possible that so many years have passed? Time does go by so fast, and of course every day is filled with priorities. But, every day we are lucky to have we are also lucky enough to have a new opportunity. 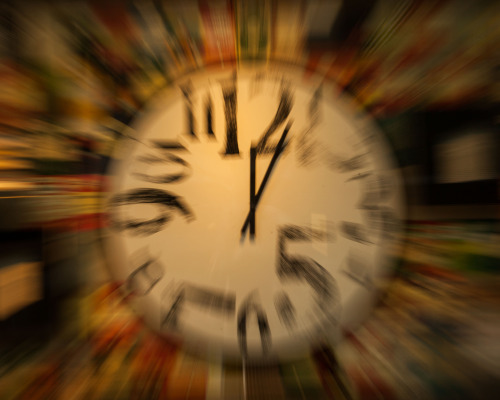 The swift passing of time is not an unfamiliar realization. I’ve certainly heard people express this same sentiment before. It is so easy to lose track of time. Personally, my days are filled to the brim with things that I “have” to do. In my personal experience, one day just rolls into the next. The week is gone, the month is gone, the year is gone… you get the idea. I woke this morning thinking about this and asking myself how she and I could have lost touch and how we allowed so many years to pass in this manner. So, there it is… the lessons of time and choice. With this being said, I think about the saying, “Don’t put off till tomorrow what you can do today”. In my book, If I Knew Then What I Know Now, (www.IfIKnewThenBook.com) I wrote how I marvel how someone, somewhere had said all these amazing quotes and sayings that have been passed down through the years. They had “been there and done that”, and gave us all these secrets to have a better life. There is so much wisdom from the past if we pay attention. “Don’t put off till tomorrow what you can do today”: What is something you have wanted to do and/or a person you have wanted to call? I’ve definitely been crossing things off my “bucket list” of things I want to do; but, what about all of those other things that I should do? We will make time in our busy lives if we really want to make the time. Truly the days go by so fast. Don’t let another pass you by without touching someone you “should” call. If you “should” do it, you probably should actually make it happen. I know I “should” have. 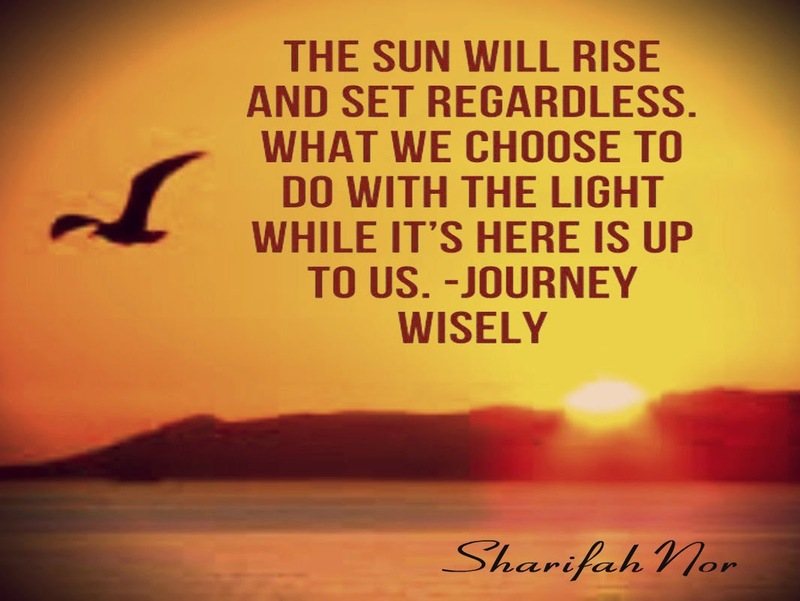 What do you CHOOSE to do today? How can you make those things a priority? And, if your day, like mine, is filled with the what I “have” to do’s, it may be time to reevaluate the “have to” and figure out how to create a schedule that suits life and love and freedom to do those things that we “should” do. I certainly plan to reevaluate things a little. After all, it is time to enjoy life. It is Time to Play! Maybe you’ve done the “grand tour” or Europe, cruised the coast of Alaska, and soaked up the sun on beaches from the Caribbean to Hawaii. Now what? For a few discerning travelers, nothing beats the allure and mystery of the untouched islands of Galapagos and the frozen-continent of Antarctica. Two “must sees” for any adventure seeker that wants to check off the ultimate bucket list destinations. The Galapagos Islands are a province of Ecuador, lying about 600 miles off its coast, and are considered one of the world’s foremost destinations for wildlife-viewing. Their isolated terrain shelter a diversity of plant and animal species, many found nowhere else. Antarctica is Earth’s southernmost continent, containing the geographic South Pole. With an area of over 5.4 million square miles, it is situated in the Antarctic region of the Southern Hemisphere, almost entirely south of the Antarctic Circle. We have sent quite a few clients on these adventures, but they are not for everyone. First off, you have to do a lot of planning, at least two or three years in advance, and because these trips sell out fast they are already sold out for 2016! Secondly, you need to work with travel professionals like us who can tailor your trip to your specifications. Luxury or rustic? Are you a full-bore offshore explorer? These destinations are both physically challenging and can take 10+ days to complete. It would be very difficult to book these trips successfully without a knowledgeable professional. The creatures that inhabit this famous archipelago are as engaging as they are unique because they don’t fear humans. Here’s your once in a lifetime opportunity to experience this living museum of natural history. One option is aboard the Celebrity Xpedition. This 98-guest mega-yacht sails to the islands seven days a week, 365 days a year. The knowledgeable crew and Galapagos National Park-certified on-board naturalists all help to preserve this delicate archipelago, while enlightening you to its natural and evolutionary significance. You can also travel to one of the last uninhabited places on Earth in style aboard Silversea Cruises. You can snorkel with sea lions, hike along lava tunnels, and experience this living museum of natural history while indulging in the unrivaled all-suite comfort and elegant sophistication of these small luxury ships. All accommodations are spacious, ocean-view suites and most include butler service and private verandas. On board Silversea’s luxury cruise ship the Silver Explorer you can revel in the beauty and overwhelming power of nature as you pass giant prisms of ice riding in an ink-blue sea. You can take a Zodiac boat to get up close and personal with whales, and walk among elephant seals and penguins, all unafraid of your presence. 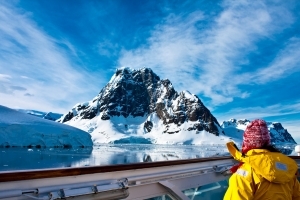 Hurtigruten Explorer ships also visit Antarctica, and they offer numerous planned and unplanned field landings ashore designed to challenge you mentally and physically, including everything from long hikes, kayaking, and glacier traversing to camping onshore and even multi-day ski expeditions. Quark Expeditions is more affordable and somewhat “rustic,” but not inexpensive. For over two decades they have been leading polar adventures, including many first-ever passenger voyages to Antarctica, including the circumnavigation of the Antarctic continent. In February 2014 we planned a fabulous Antarctic cruise for two of our clients aboard a Quark Expedition cruise. If you would like to see what their trip looked like, click here: Norton and Herb’s Excellent Antarctic Adventure. So you have many options that include using the Cruise Planners’ layaway plan, which will help you save for these once-in-a-lifetime trips. We will help you pick what’s best for your situation and budget. And our computerized rate alerts advise us in the event prices drop and we always pass those savings on to you. Sound exciting? Give us a call now at 631-893-4232 and we will start planning your adventure holiday to the Galapagos Islands or Antarctica for 2017! There are many statistics and studies that show the effects of reactive education, counseling and treatment for those who experience a negative life experience, including those who participate in self destructive behaviors and/or who are suffering from depression. Additionally, in light of the fact that the average life expectancy in the United States is currently 78.8 years, it seems imperative to address quality of life issues early in life in order to facilitate the longest possible quality of life experience. An article published by the World Health Organization (WHO), “Depression, A Global Public Health Concern”, confirms the work of the Time to Play Foundation, a not for profit organization that encourages everyone to enjoy life. In the WHO report, it was noted that over 350 million people in the world suffer from depression, which, at its worst, could lead to suicide. The article noted that almost 1 million lives are lost to suicide yearly, which equates to approximately 3,000 deaths by suicide per day. It is our position that treatment, provided reactively after development of the symptoms of depression, is less effective than a proactive approach. Further, the WHO article did emphasize that that the prevention of depression is an area that deserves attention. In our society it is common knowledge that those in their mid to late life experience the proverbial “mid-life crisis” to search for their life purpose, quality of life and life enjoyment; but, today, it is evident that many of our youth are plagued with self-destructive behaviors, depression and /or suicidal ideation, translating to a painful and displeasing life experience. In response to these, the self-help industry has exploded to an over $11 billion a year industry that preys on those experiencing a negative life experience. For so many there is a need for counseling, encouragement, and education to assist them in recovery of their mental health status. The Time to Play Foundation’s intention is to encourage people to enjoy life in a proactive manner, and believes in a proactive approach and the concept of PREinvention® vs. REcovery. It is evident in our society today that the focus is more reactive than proactive and utilizes the practices of REinvention and REcovery vs. the concept of PREvention and PREinvention®. In 1855 Frederick Douglass said, “It is easier to build strong children than to repair broken men”. While the background behind this statement was not solely in reference to creating a mentally healthy and stable population, it can be utilized to emphasize this proactive idea of PREinvention® that could be easily implemented into our population today. Therefore, it may be emphasized that an enjoyable life experience starts with a healthy thought process and healthy self-perception. In the reactive recovery process we utilize today through our current self-help industry, we hear over and again how people cannot let go of their past and see how self-destructive behaviors are developed in response to lack of life skills and coping skills. This thought process is what feeds our self-help industry, where we try to unravel past damage and unhealthy thoughts that cause the underlying motives behind self-destructive behaviors. With this more proactive approach it seems to be possible to eliminate so many who spend much of their lives without life enjoyment and that we can facilitate a better life experience for a longer period of time. The Time to Play Foundation’s team acknowledged the importance to look for a root cause that may provide insight as to why people are not enjoying or not able to enjoy life. 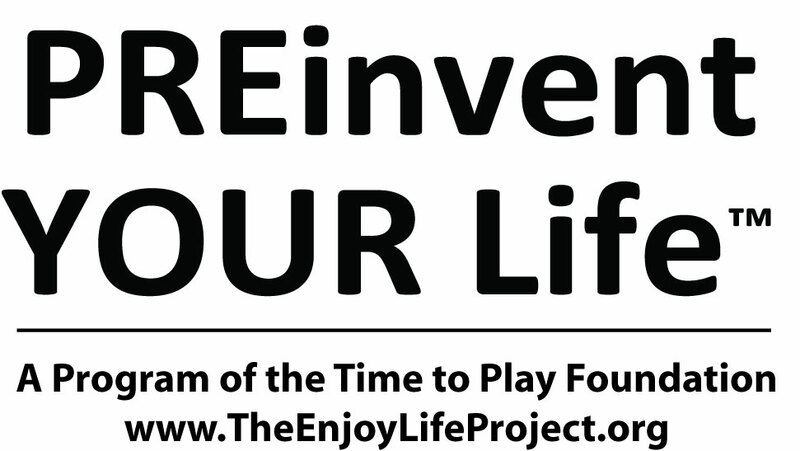 In April, 2015 the Foundation conducted a survey entitled PREinvent YOUR Life® to high school students in grades 9 – 12 at the Comsewogue High School in New York. There were 727 voluntary, anonymous respondents out of 1131 students present, a statistically significant survey that represented the whole. The findings were mind-blowing and provided valuable PREventive insight, as well as a “key” concept that may not only eliminate self destructive behaviors, but provide an opportunity for us to implement an easy strategy while raising our children that will provide them a lifetime of success and life enjoyment. The findings showed that 90.65% of the respondents agreed or strongly agreed that “how to be happy as myself” was the most important “how to” in order to have an enjoyable life experience. The survey was developed by Doreen Guma, an expert in quality improvement and the Founder of the Time to Play Foundation, who researched many reactive processes and experts in the self-help industry and compiled data for the survey over a 2 ½ year period. The survey was developed by a team selected by Mrs. Guma to create a streamlined inquiry. Following the survey, the insight gleaned was validated through discussion with students and young adults. There was agreement supporting the idea that, if the students had learned preventive, positive coping skills, they may have chosen a different way with dealing with life situations they had encountered thus far in their lives. It stands to reason that these positive skills, learned early, would have impact on overall life satisfaction throughout an entire lifetime. The study findings were most telling, and potentially provide a KEY to quality of life. Considering the implications behind the skill of “how to be happy as myself”, it is may be safe to summarize that, if a person is happy as themselves, and loves themselves, there is potential to eliminate self-destructive behaviors adopted to fill a void and/or hide some type of personal pain; for example, self-harm, suicide, or alcoholism. Further, it could be deduced that if a person is happy as themselves, they may not adopt these types of hurtful actions. It may be safe to go a little further to note that, if a person loved themselves, they will protect themselves. Therefore, if we can encourage and educate our children in a proactive manner how to “be happy as myself”, we have the potential to create a population of persons with self-esteem, self-confidence, self-love, and self-worth. In summary, based on the preliminary findings of the PREinvent YOUR Life® survey, it can be suggested that early intervention programs for ALL children, beginning with parents, support the possibility of the prevention of the development of depression, self-destructive behaviors and an adverse life experience. The Time to Play Foundation is in final stages of development of the proactive PREinvent YOUR Life® programs for expectant parents and early childhood intervention programs and educators, spurring further research on the effectiveness of this approach. Dr. Salvarodos’ essay overview of the findings from the PREinvent YOUR Life® survey, incorporating his years of direct observance of students entitled Developmentally Making the Right Choices, is available at Developmentally Making the Right Choices. Dr. Salvarodos is also a founding member of the Gardner Massachusetts Suicide Prevention Task Force created in response to the per-capita rate of suicide in his area. He is a strong supporter of the PREinvent YOUR Life™ concept. 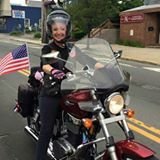 I’ve written about my experience riding my motorcycle before, but I felt compelled to write about my progress after riding today. In 1986 I told my husband (then boyfriend) that I wanted to get a motorcycle. At some point he purchased one, and I sat on the back, as a passenger, since… until last July. One of the members of our firefighter motorcycle club suddenly passed away at 48 years old. With that, I decided “today was someday”, and not only got my motorcycle license, but my very own motorcycle. Even though I had wanted to ride for almost 30 years, and even though I wanted to be so “good at it”, I admit I was a little fearful. I made lots of excuses to others and to myself to justify my skill set. I pretty much even talked myself into believing that if I had gotten that motorcycle at 20 years old it would have been easier to learn the skills to ride. Nevertheless, I kept at it even though sometimes it was frustrating. There were a few times I internally quit and didn’t ride for days. Riding a motorcycle, even though you wouldn’t think it because the people who ride make it look so easy, takes great skill (at least in my opinion). Last weekend, we went on a long ride with 30 other motorcycles. Over 120 miles later, on the ride back, I went around a turn in a manner that was stiff. So stiffly, that I actually was deciding that, if this was how I was going to ride, I should just go back to being a passenger. In my mind I was recounting the many miles we had traveled. In my mind I was “yelling” at how I could still “not be good at this”. Riding a curve stiffly is not a good way to ride a curve. I couldn’t imagine, at this point, after so many months later, how I could not yet have the skills I knew I needed. Then, it clicked. I can’t exactly explain it. I started “gliding”. Gliding is the best way I can explain it. I was no longer stiff going around the curves, but the motorcycle skillfully went around them, smoothly. How many times have we encountered situations like this, where we decided something was just too hard or “impossible”, and quit… If I had quit, it would have been just before I “got it”. My reflection today is really just this. Coming to terms with the little voices within that tell us we “can’t”, or that, perhaps, we’re “not good enough” to accomplish something. You know that if you really want to accomplish something, it is possible. We can be taught, but we have to “get it” on our terms and when it’s time for us to trust. Don’t believe that you’ll never “get it”. Don’t give up on getting the skills you need. Keep at it. Want to speak in public? Practice. Want to roller blade? Practice. Want to ride a motorcycle? Practice. Want to play the cello? Practice. Want to do ballroom dancing? Practice. Want to do gymnastics, play a sport…. ________________ (fill in the blank). You get the idea. Knowing that most of us are not born with the skills to do those things that we admire, or things we think we could never do, I truly believe that those who put in the time and the practice do get there. Maybe it takes some people – like me – longer than others. That’s ok! If you keep at it, you will get there. I promise. If it is something you truly want to do, take that first step and start. Don’t wait to have regrets that you didn’t give it a try. Just go and start. I promise that, with some time and some practice, you’ll be gliding, too. I saw this on Facebook the other day. It is a quick visual that really puts things into perspective, and maybe will encourage a positive action to change our lives. So many times, I believe, we get “stuck” doing the same old thing. Sometimes whatever it is we are doing in our day becomes drudgery, where we are dreading getting up to go to, or to do, whatever it may be. But, yet, out of habit or obligation we just keep doing or going. My son is a prime example. He had a job he hated. It pretty much sucked the life-blood out of him, but he went. He dreaded going there, hated being there, and felt devalued as a person after he left. It made for an incredibly unhappy existence, as his whole world pretty much revolved around the distress of his job. To add to the despair, the salary he received was meager, and it was difficult for him to pay his bills. He stayed on with this for over a year, feeling like he was trapped and had no other choices. And complaining. He did a lot of complaining. But, no matter what we told him, or how we encouraged him, or with any suggestions we gave to him, HE decided he was trapped and had no other choices. One day he happened to go to a place that was hiring. Coincidence or not, he was able to change jobs and his whole demeanor shifted to enable him to better enjoy life. He was no longer a “prisoner” in a situation he facilitated, but had experienced a year of his life unhappy, frustrated and stressed out. Is this something that you find yourself experiencing? I have learned through working on the Time to Play project that our emotions are a guide. If we feel upset, uptight, frustrated, unhappy (you get the idea) in a situation or while doing or participating in something, that might just be a trigger that you need to change something. Even though, as you read this, you might be thinking that it sounds easy but that is not possible to change your situation, you might be able to, at least, begin with a small change that can lead up to a larger change towards your better quality of life. If nothing else, the exercise on the graphic is pretty easy. Get out that piece of paper. 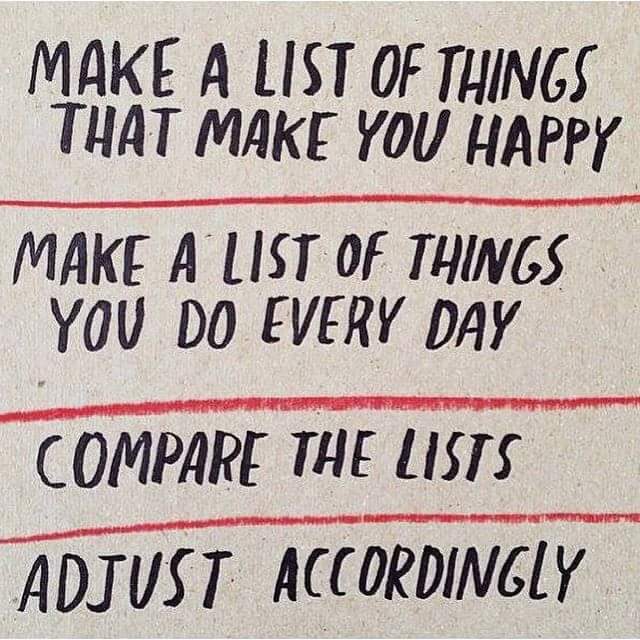 Make a list of things that make you happy. Make a list of things you do every day. Compare the lists. To “adjust accordingly”, make another column with options to begin the process to make the change towards those things. Pick something that is possible for you to begin with to make your change happen. Just keep in mind that a list is just a list unless you actually cross something off. Then it is a reality.